Trishund Ganapati (Ganesha with trifurcated trunk). I did not know such an exqusitely carved temple existed right in the middle of Pune city till a couple of days ago when Urban sketchers decided to sketch there. 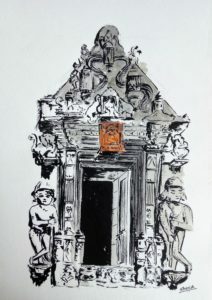 In the limited time available, I could sketch only the entrance of this 18th century temple. The stone carvings are so exquisite, that they are overwhelming!